Our Blended Blessings: Wrapping It Up and a Give Away!!! Wrapping It Up and a Give Away!!! Yesterday was the end of our Whole30. So...today, I had pancakes for breakfast and pizza with a Coke for lunch. KIDDING!!! Today, I've eaten exactly the same way that I've been eating since October 1st. To be honest, in the beginning of this, I thought that after the 30 days we would go back to having pizza nights once a week and/or a cheat day. What I've come to realize is that I don't want to live like that! I don't want to view food like that. Food needs to nourish my body, provide a benefit. I'm not saying that there will never be a meal for us that isn't Paleo. As a matter of fact, this weekend is my youngest daughter's birthday party. She is having a regular birthday cake with buttercream frosting. We ordered just enough for the party and I don't like cake! Now to figure out what to do with all of their Halloween candy... I'm sure I would have trouble passing up a Snickers or Reese's Peanut Butter Cup. I've had a couple of people ask about our results. While our daughters also had significant weight loss, I'm not posting their numbers. My husband, -13.4 pounds and me, -12.5. This has never solely been about the weight loss. But it is a definite perk! This is a photo taken on Monday night at a Mary Kay meeting. In light of it being Halloween week, our director (the cute little witch in the middle) asked us to come in costume. Generally speaking, Mary Kay asks us to come dressed in dresses/skirts. So, I wasn't going to pass up the chance to come in comfy clothes. Apparently, my friend Debbie and I had the same idea! She was a yoga instructor and I was a personal trainer/runner. Clever, huh? I've posted this photo because a month ago, I would not have been able to comfortably zip this jacket. That is a measure of success for me. I feel happier! My family seems to feel happier! We are learning to try new foods. Because we have not been eating at restaurants, we've enjoyed more meals, together, around our dining room table. My cravings have been minimized. My joints are less achy. This is a huge WIN for our whole family! 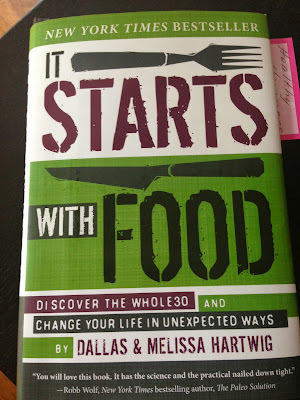 Because I truly feel that "It Starts With Food" has completely changed my view of food and nutrition, I want to pay it forward. 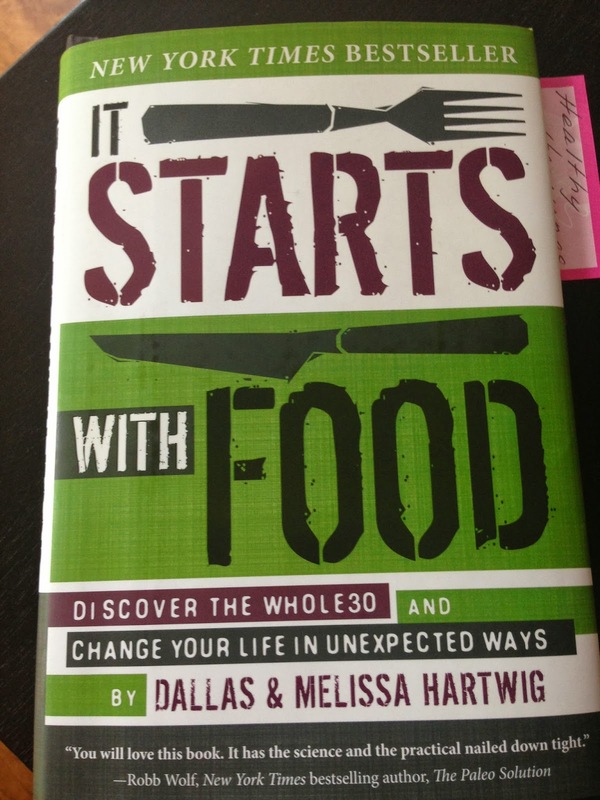 I am giving a copy of this book to someone who will REALLY be committed to following Whole30 for a minimum of 30 days. AND, you must be willing to share your results with me in the end so I can post them on my blog. Results should include weight loss but even more importantly, changes that you've noticed in your body, physically and emotionally. How do you enter? It's simple. "Like" my Facebook page Our Blended Blessings and comment either here or on the Facebook post telling me why you are willing to make this change. This book is not being donated to me. I am purchasing it and will either mail it to or hand it to the winner. I wholeheartedly believe that it will "change your life in unexpected ways". I will announce the winner on Monday, November 4th!! !